Run a restaurant, cafe or retail business? It might pay to take a closer look at the rates your staff are getting paid. Running a business can be a tricky undertaking. With so many things on the go, and so many rules to follow it’s easy to become overwhelmed. Fail to pay yourstaff correctly however, and you could see yourself with a fine and your business having to pay back thousands, if not hundreds of thousands. An Adelaide restaurant, that underpaid its staff $69,000 over the span of less than a year. A Melbourne cafe that was fined $110,000 after paying staff as little as $8/hour. A retailer that was fined $76,000 for underpaying staff. A Sydney childcare operator that was personally fined $28,900 for underpaying staff $360,000. 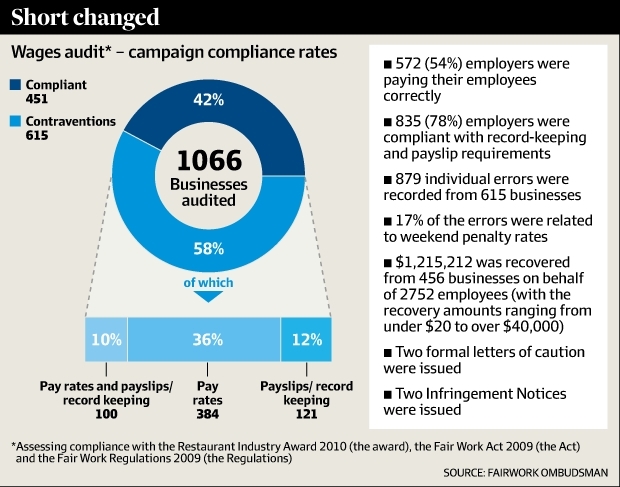 And the fast food restaurant, Red Rooster had to pay back $645,000 to nearly half its workforce, after a Fair Work audit revealed staff had been underpaid during 2011 and 2012. It’s a stark reminder for all business owners and managers to ensure their staff are paid the adequate amount, including penalty rates, and are given adequate breaks. If you think paying staff hurts your cash-flow, think about what it’s like to have 90 days to pay back these amounts (with interest). While there will of course be the occasional business owner who deliberately tries to dodge the law, these cases highlight the problem business owners face in being abreast of business law, adequate pay, payroll, breaks and rosters. Unfortunately, thousands of businesses still run their rostering off Excel spreadsheets, or even worse, pen and paper. This obviously is not only an inefficiency (which can easily be resolved through workforce management systems), but it also leads to legal problems further down the track as the business scales, and things get missed – with the above examples case in point. Things such as rostering, communication, time and attendance, breaks, awards, leave and unavailability, managing multiple locations, shift swaps, payroll integration and reporting, are all easily managed within workforce management systems (some even being cloud-based, such as our Ento app). Instead of spending hours creating, managing and communicating rosters with staff, managers and business owners can easily create and manage everything within minutes using workforce management software. And Ento will even help you to work out when staff are required to take breaks, when they have penalty rates or their availability, through pre-populated awards or custom award interpretation. All of this helps to create a more efficient workplace and avoid costly fines or paybacks. While you must comply with minimum standards, it’s also worth looking at offering additional benefits or perks to your staff, to boost morale, improve productivity and reduce staff turnover. The cost in offering these perks is often easily outweighed by improvements in productivity or savings in recruitment and training, so in many cases it’s a no-brainer. It even helps to create a competitive advantage among prospective staff.